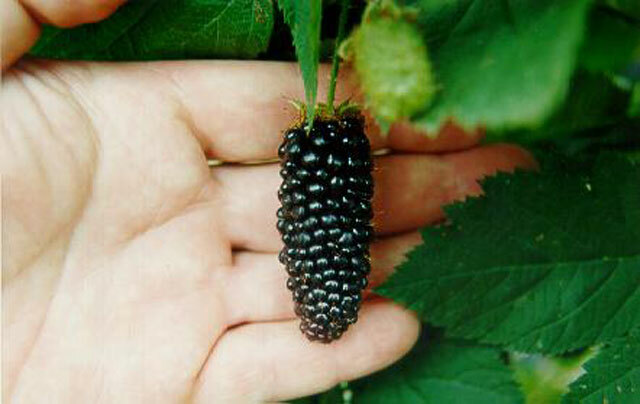 Karaka Black fruiting season is very long, producing high quality fruit for six to eight weeks. In New Zealand, Karaka Black starts to ripen at the same time as Silvan. The fruit is well displayed and is very easy to pick. 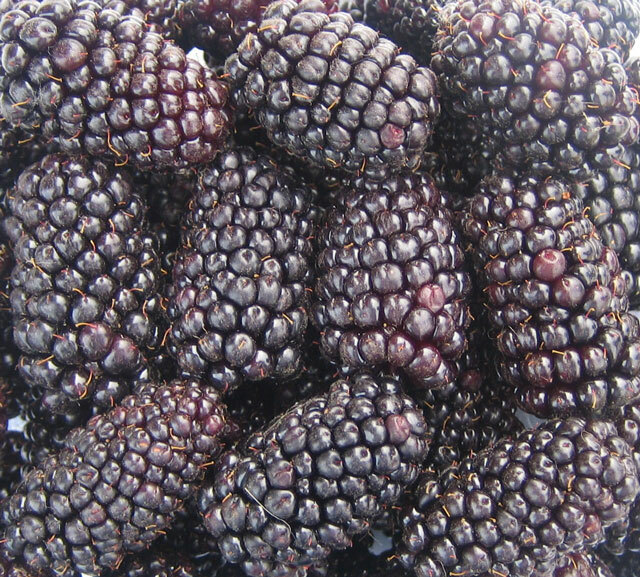 The dark black fruit has a long cylindrical-conical shape, is very firm and very shiny. The flavour is likened to a mild blackberry, and may be somewhat acidic when picked slightly under-ripe or grown in a cool climate. Fruit size is large, with an average weight of 10-11g, and is larger than Kotata and Waldo. Shelf life of the fruit is outstanding. Karaka Black yield is high, approximately 15t/ha, compared to the cultivars Silvan at 13t/ha and Waldo at 10t/ha. In trials in New Zealand, Karaka Black has achieved yields of over 25t/ha. Canes have moderate vigour and are less spiny than Boysenberry or Silvan blackberry. Moderate plant vigour makes it appropriate to plant this cultivar at 1m spacing to ensure a high yield. The plant habit is trailing. 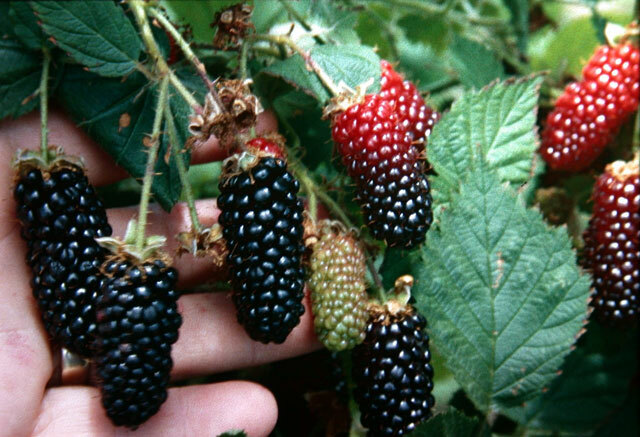 The plant has moderate disease resistance to downy mildew (Peronospora sparsa), the cause of ‘dry berry’ disease and to fruit Botrytis due to fruit firmness. 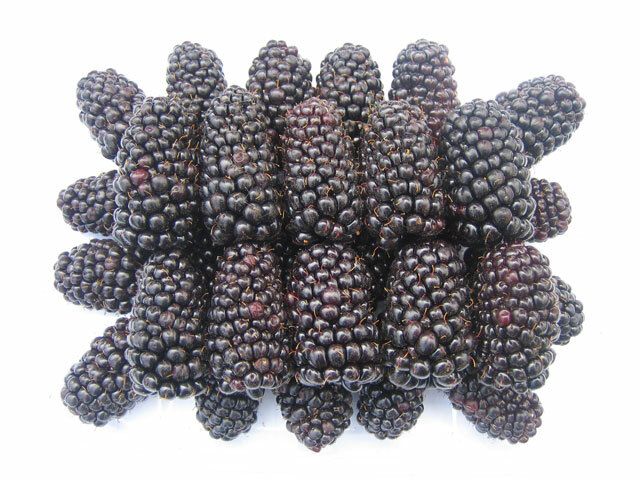 Karaka Black is suitable for fresh market, processing and pick your own. In a cool climate this cultivar is well suited to tunnel production of fruit for fresh market.